What is a Multispectral camera agriculture. 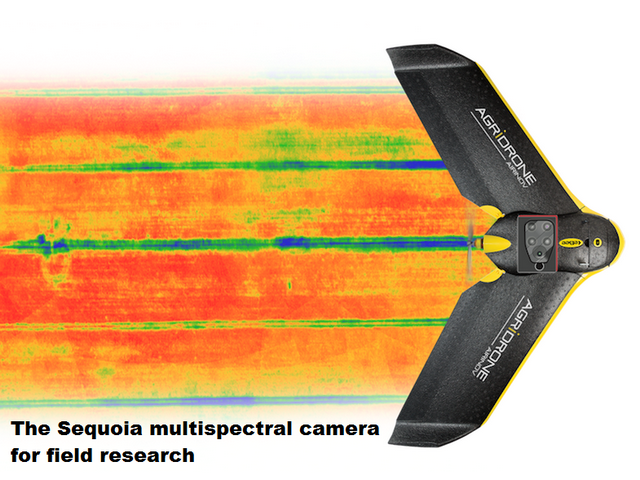 A Multispectral camera agriculture sensor captures multiple images in the ultraviolet visible and infrared ranges. It allows professional farmers to manage crops, yields, fertilizing and irrigation more effectively. Each of the images taken with a Multispectral camera for precision agriculture is passed through a filter to restrict light to a specific color or wavelength.There are huge benefits of Multispectral sensors for both to the farmer and to the wider environment by minimizing the use of pesticides, fertilizers, wastage of water and at the same time increasing the yields at harvest time. How does a Multispectral camera agriculture work in order to understand Multispectral camera technology. It is useful to consider first how monochrome and color. Cameras work a monochrome. Camera contains an image sensor which is comprised of a two-dimensional array of light-sensitive pixels. These pixels are sensitive to incoming light across a broad spectral range for example in a monochrome CMOS image sensor. Each pixel is sensitive to light from 400 nanometers to 1,000 nanometers covering visible and NIR ranges a monochrome image sensor captures light at all. Wavelengths and hence cannot discriminate between different colors and wavelengths of light. The images are black and white like a monochrome camera. A color camera contains an image sensor with a two-dimensional array of pixels however in a color camera. The multispectral camera remote sensing is coated with a mosaic arrangement of pigments that transmit red, green or blue. These pigments make up what is called the Color Filter Array (CFA) well-known from common RGB cameras. A Multispectral camera remote sensing imaging technology is one that captures image data within specific wavelength ranges across that uses Green, Red, Red-Edge and Near Infrared wavebands to reflect both visible and invisible images of crops and vegetation. The Multispectral images integrate with specialized agriculture software which output the information into meaningful data. A raw image captured with a color camera can be thought of as three separate images which when recombined through a debayering process form a familiar color image. Spectral imaging devices typically employ similar principles for generating Multispectral images. However, patterning pigments representing red and blue colors on the image sensor spectral devices pattern the sensor with micro sized optical filters that have tunable color and transmission characteristics. A raw image captured with a Multispectral camera agriculture can be thought of as four separate images each taken at a specific wavelength with well-defined bandwidth for example an RGB-NIR multispectral camera. It has red, green, blue, and NIR bands. The RGB mono Multispectral camera has red, green, blue, and pan chromatic bands. Spectral devices Multispectral camera for precision agriculture has yellow, red, red-edge and NIR bands. This farm telemetry data allow the professional farmers to monitor, plan and manage the farm more effectively saving time and money along with reducing the use of pesticides. In addition to, the benefits of implementing telemetry in farm is to remotely monitor water points on large-scale cattle properties. In this post, Agrotechnomarket explains the basics of Multispectral imaging technology, reflectance, wavebands and vegetation indices such as NDVI and NDRE. All this information gives the professional farmer terrific insights into the health of the soil, livestock and plants. We also show you the latest multispectral sensors for drones in farming. Let’s take a look now at some of the latest multispectral imaging remote sensors. There are Sentera, Parrot Sequoia, Tetracam, and many more. 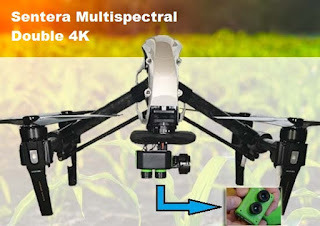 The technology Multispectral images are a very effective tool for evaluating soil productivity and analyzing or detecting plant health both with stations positioned at fixed points in particularly delicate areas, or with mobile devices mounted on unmanned air vehicles (UAVs), commonly known as a drone. Surveying the health of soil, crops and livestocks with drones, you can obtain a high spatial detail of the information, different with the naked eye, you will get very limited information. A Multispectral sensor technology allows the farmer to see further than the naked eye, coupled with the enormous speed acquisition in analysis of the data. Identify pests, crop diseases and weeds. Optimize pesticide usage and crop sprays through early detection. Provide data on soil fertility and refine fertilization by detecting nutrient deficiencies. Help with land management and whether to take agriculture yield in or out of production or rotate crops etc. Count plants and determine population or spacing issues. Estimate crop yields. Measure for the best irrigation system in a area. Control crop irrigation by identifying areas where water stress is suspected. Then, make improvement to land areas such as install drainage systems and waterways based on the Multispectral data. View damage to crops from farm machinery and make necessary repairs or replace problematic machinery. Survey fencing and farm buildings. Drones are based on instantaneous phenomena, allowing rapid and appropriate measurements which can be carried out also by a long-range remote controller. Multispectral imagery sensor technology can be used throughout the crop cycle. Whether used during sowing, irrigation, fertilization or harvesting, drones providing Multispectral imagery can be used at each step allowing the grower to manage his crops very effectively in every season. Monitor livestock. Now drones with thermal cameras can be used to locate livestock at night time along with many other terrific uses. With Multispectral advanced sensors and imaging capabilities, this gives farmers new ways to increase yields and reduce crop damage. Happy farming! 1 Response to "Multispectral Camera Sensors in Agriculture Sectors"
It's really an awesome way to get the info of identifying farming, pests, crop diseases and weeds. 3D model Denver, Colorado really a awesome project to get all thing covered perfectly.